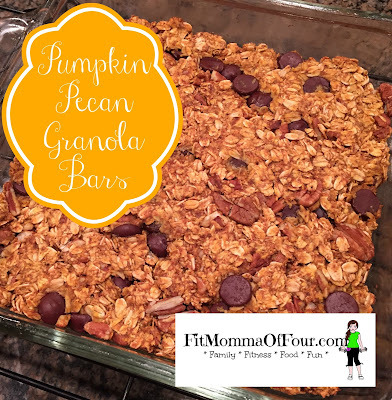 Chewy granola goodness that the whole family will devour! *raisins would also be amazing in this! grease an 8x8 baking pan with cooking spray or coconut oil. 2. In a small bowl combine applesauce, pumpkin puree, honey, & vanilla. 3. In a large bowl combine rolled oats & spices. 4. Pour wet ingredients into dry ingredients & stir until well combined. 5. Fold in pecans & chocolate chips (or raisins). 6. Spread evenly in a greased 8x8 pan. 7. Bake 25-30 minutes at 350 degrees, or until golden brown. 8. Remove granola bars from the oven & allow to cool for 20 minutes before cutting into 8 bars or 16 squares. Click here for more family-friendly clean eating recipes.